Abstract: Corsair has recently celebrated their 10th anniversary, which is quite a milestone for a memory company! Corsair has recently celebrated their 10th anniversary, which is quite a milestone for a memory company! I think it's high level of customer service that sets apart successful companies from the rest, and a growing trend in this corporate schmooze-fest with consumer loyalty is the manufacturer run support forum. Now, instead of emailing an anonymous tech support guy the same question a hundred other people have asked, you can read through a support FAQ, or post a thread in the support forums and someone will answer. In Corsair's case, "RAM GUY" dishes out the info and advice on using the companies memory products. Imagine if Microsoft had their own support forums for everyone who ever suffered the rather of the "BSOD"! 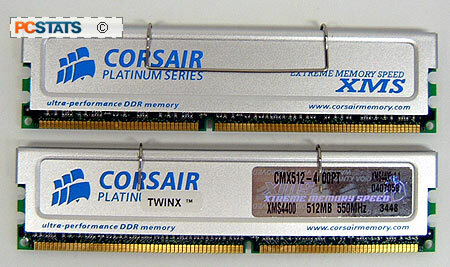 Anyway, getting back on topic, today PCstats is testing out a pair of Corsair's TwinX1024-4400PT dual channel DDR memory. This is the latest memory from Corsair, and remarkably difficult to get a hold of... even for us. Apparently, a shortage of good low latency DRAMs has meant that companies are reserving most of their best memory for you, the consumer. Thanks to Ramstore.ca for hooking us up with these modules to test. As you can see Corsair use platinum coloured aluminum heatspreaders to help keep the memory cool. The heatspreaders do lower the overall operating temperatures of memory modules a bit, but they do little to nothing to enhance overclockability. Still, memory heatspreaders protect the DIMM's from physical damage; I don't know about you, but I've knocked those tiny resistors off a few sticks of memory in my time. Each double sided DIMM has sixteen 256Mb DRAMs which give you a total of 512MB of RAM each. Officially the TwinX4400PT is designed to run on Intel systems (Corsair state that in their documentation ) and is rated for dual channel configuration at 275 MHz, with 3-4-4-8 memory timings and at a voltage of 2.75V. Because these little silver wonders are destined to go right back from where they came, we were not at liberty to pry the heatspreaders off and take a peak below. I suspect the TwinX4400PT modules are using Hynix D43 DRAM.... good stuff that Hynix, it clocks higher than most any memory we've tested on an Intel platform. Ahh sweet overclocking... it's what we all strive for really, isn't it? Like all high speed memory modules these days, Corsair really mean it when they say the TwinX4400PT "is best suited for Intel systems." The tests began on the Athlon64 test system here, but the memory wouldn't run timings tighter than 3-4-4-8. If we changed them to anything else, the system refused to POST.... not a good start. Ultimately, we didn't have much success raising the clock speed of the motherboard either, the maximum the memory/board would do was a lowly 210 MHz. It shouldn't be much of a surprise as this Corsair memory as not intended to be used (or overclocked) in an Athlon64 system anyway. On the Intel side of the fence things were much different, the TwinX4400PT DIMMs did not like any timings other than stock, but ran fast. The memory would easily reach 275 MHz with 2.8V, and yet be prime95 stable. Odly, 276MHz would cause WindowsXP to lock up every time. It's a very weird problem and unfortunately we couldn't find a way around it. Still, 275 MHz FSB is a pretty sweet number. Intel users will also be happy to hear that the TwinX4400PT had no problems with the 5:4 or 3:2 memory dividers either.